The Greatest Love starts off like many other kdramas. Goo Ae Jung is a sweet underdog who keeps encountering the popular-but-haughty Dokko Jin. Despite their surface differences, they have an inexplicable attraction to each other that they can’t fight. Ae Jung might have a sweeter guy in her life, but her electric banter and interactions with Dokko Jin are irresistible, and eventually the two capitulate into a relationship, despite great resistance from outside forces. The Greatest Love is so much more than that, not the least because it’s a Hong Sisters drama and that almost always guarantees adorable leads and snappy banter and action. But the series doesn’t stop there. It’s a fascinating commentary on pop culture, star-obsession, and the power of image. The National Treasure Girls. Kang Se Ri – far left, and Ae Jung – middle right. Ae Jung is the D-list celebrity that Korea loves to hate. She was the leader of a pop group years before, but the group broke up amid scandal and she took the blame. While another one of her group members, Kang Se Ri, has gone on to become Korea’s sweetheart, Ae Jung’s been reduced to a tabloid punch line. She makes her living appearing on variety shows doing things like trying to eat jajangmyeon while on a roller coaster. She doesn’t do it to hold on to whatever scraps of fame she has left; Ae Jung is the primary breadwinner of her family. She lives with and supports her father, brother, and nephew; her brother is even her manager. Represented by the same talent agency as Ae Jung is Dokko Jin, Korea’s hottest A-lister. He’s a box-office-topping action hero who’s courting Hollywood fame. The two run into each other around the office, as it were, and the above-mentioned typical (but always so delicious) bickering hate-turns-to-love flirtation ensues. The Greatest Love would be a fun kdrama on the strength of this stage alone. As always, the Hong Sisters deliver a snappy series with an adorable pairing. As has been their wont lately, they also craft a hilarious, over-the-top lead character just waiting for the right performance, and that’s found in Cha Seung Won as Dokko Jin. Think Tom Cruise in Tropic Thunder levels of parody here. Dokko Jin is petty and childish, but played up in such a hammy, he-is-almost-like-a-literal-child-sometimes way that it’s impossible to do anything but laugh at his constant ridiculousness. The series is really worth watching just for Dokko Jin’s antics and his eventually sweet relationship with Ae Jung. Then the show becomes so much more. It starts with a critique of celebrity culture. The Korean public loves to hate Ae Jung because they blame her for something that’s entirely untrue. The Greatest Love involves a round of noble idiocy, but for once it’s not to do with the leading couple. Ae Jung fell on her sword to protect another member of her pop group. It’s a little sigh-inducing that the leading lady yet again meekly takes all of the vitriol that’s tossed at her – from an entire country, in this case – with nary a peep, but at least 1) she’s not doing it because of the leading man, and 2) it functions as part of the show’s meta commentary. 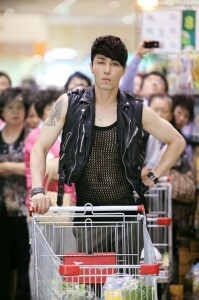 Dokko Jin posing like a doof while grocery shopping. Who even goes to a Costco-style warehouse store dressed like that? Because we have a strange approach to how we treat celebrities. We act like we know them and understand their actions. They’re casually judged around water coolers. In The Greatest Love, careers are made or broken by “netizens” (a real term that’s used to describe Internet commenters in Korea), by people rushing online to praise or condemn other people that they’ve never met. Ae Jung’s livelihood, indeed that of her whole family, is based around whether or not the country is interested enough in her to want to see her get humiliated on reality television. Several times I wondered if Ae Jung couldn’t just leave the business and get an entirely unrelated job, as some of her other band members have done. This is how Ae Jung knows how to best take care of her family, however, so it’s what she does. When Ae Jung and Dokko Jin enter into a relationship, and she has to face the prospect of Korea hating her in a much stronger way for daring to date one of its top stars, the commentary of the show really kicks in. I thought I’d be annoyed by the plot development, because I am so sick of the “everyone wants to break the lead couple apart” trope in kdramas (seriously: does anyone really care that much whether or not two people date?). In this case, the Hong Sisters were doing something with that development.